The ring-shaped mag. 10.8 planetary nebula, NGC2438 (Herschel H IV.39) is a 1.3′ dia. 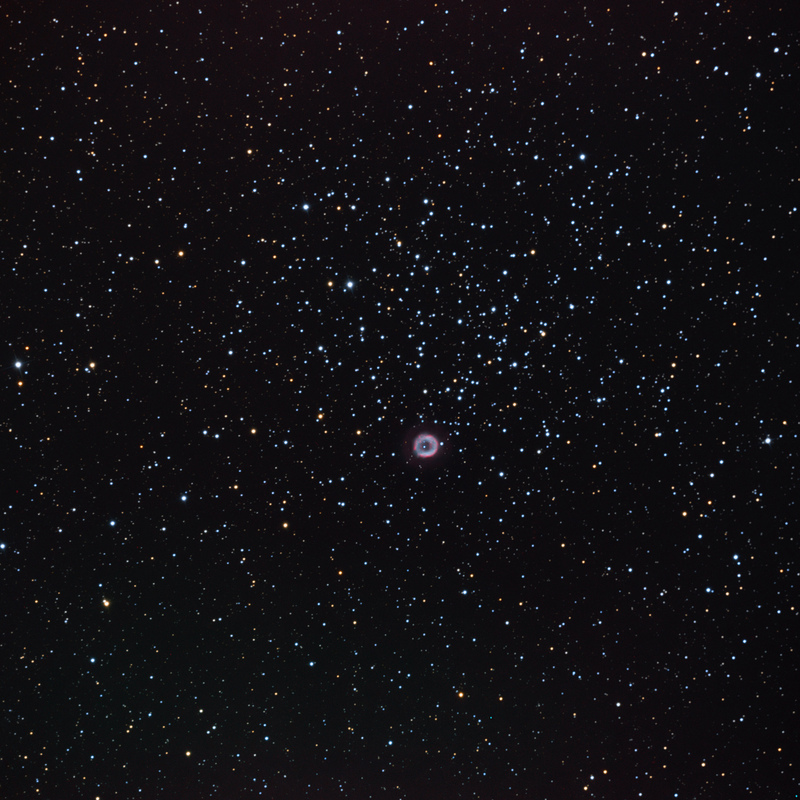 planetary nebula in the constellaiton Puppis that appears within the larger 20′, mag 6.1 open cluster, NGC 2437 (M46). NGC2438 is superimpsed on M46 but is not a member of the open cluster. It is 2,900 light years distant and was discovered by Herschel in 1786, whereas M46 is thought to be 300 million years old and is 5,000 light years distant. The bright star near the center of the nebula is not the proginator star, which is likely to be the adjacent small, bluish star that SEDS indicates is a mag 17.2 star. The planetary nebula color and detail were augmented with 1 hour of Astrodon 3 nm OIII and 1.3 hrs of 5 nm H-a. The OIII has the shape of a complete ring whereas Ha forms an horseshoe shape with the opening toward th north (lower left). There is an extended halo ~2.5′ in diameter surrounding NGC 2438 that is brought out by the narrowband data.